As a developer, I had second thoughts about approaching the Advanced Administrator exam. I felt that it may not be necessary but soon I felt that I needed to nail this exam before I start working for the big one which is the Technical Architect exam. So I ended up studying for a whole day (9-12 hours) and took the exam the next day at noon. The exam was actually pretty challenging and I was glad that I took it. So in case you want to attempt this exam, here are the most important areas that you need to know. 1. For the exam, security is the most important topic. Lots of trick questions appeared on the exam. They want to test if you know how object level and record level security work together. Also what happens when you throw territory management and account sharing or even role hierarchy into the mix. In other words your understanding of the Salesforce security model should be bullet proof. 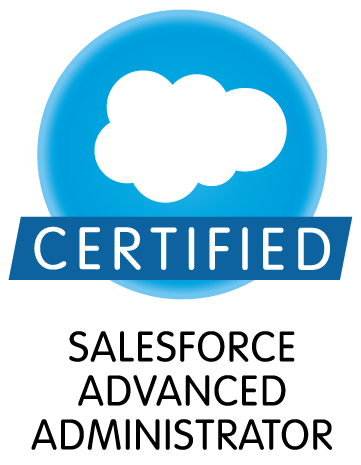 Read this resource to get a good understanding of SFDC security. You can probably skip the last chapter on advanced topics such as cross site scripting etc. 2. The above link also has a section on field history and setup audit trail. Please go through how debug logs work in the online help as well. You are expected to know the differences between these and which would would help an admin investigate a particular problem. You need to know territory management well and also know what the prerequisite to implementing it is. 4. Understand the basics of collaborative forecasting and customizable forecasting. I went through the online help topics for for both. 5. Review the online help for products, schedules, pricebooks and quotes. You are expected to know how to set these up and how to troubleshoot these. 6. Review the online help for Entitlements and Service contracts along with setting up knowledge. 7. Understand the reporting features well. You need to know how admins can use different types of reports to solve business needs. Understand cross object filters on reports and why they are used. 9. Content management and the options available when setting up libraries. 10. Know object management well. Know the differences between lookup and master-detail and when to use these relationships. Know what hierarchical and self relationships are. You should know how to convert a lookup relationship to a master-detail. 11. You know know formula fields and the basics of how to write them. For example: Understand how to do date differences or use to the VLOOKUP function. 12. The different type of sandboxes and when to use which one. 13. The different options used for migrating meta data between SFDC orgs and the use cases for each. 14. Understand the uses cases for the APEX data loader and its limitations. Understand what is meant by data quality and how it can be mitigated. (Example: data de-duplication). 14. Understand how an admin would get about troubleshooting the approval processes. 15. Understand how an admin would get about troubleshooting the quotes. 16. DELEGATED AUTHENTICATION. Know this inside out. As always, go through the official study guide. Make your own study plan. Avoid looking at a lot of online questions. Many could be outdated. If you have time, review the latest release notes. These blogs and links helped me prepare. Finally, I took just 45 minutes to complete the exam and reviewed all my answers one time before submitting the exam, giving some feedback and seeing that beautiful “Pass” show up on my screen. So time yourself well and you should complete this exam with plenty of time to spare. Good luck and please holler in the comments below if you have any questions or need help from me. Thanks!